It’s called the Eastern Hulafish, Trachinops taeniatus, an unexpected aquacultured newcomer for the reef aquarist, and it’s exclusively available from its breeder, Oceans, Reefs & Aquariums (ORA) of Fort Pierce, Florida. This subtropical species is from New South Wales off southern Australia and is related to the assessors and comets, all in the family Plesiopidae. The fish is not unknown to marine aquarists and divers who study the reef fishes of Australia, but it comes from cooler temperate waters where little commercial collecting takes place. 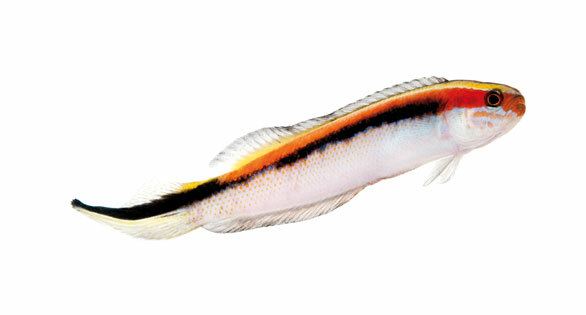 These are very colorful fish, with a black stripe running down the middle of the elongate body from the operculum toward the tail. They are red and yellow above the black stripe and the ventral portion is white. Some have iridescent blue scales on the face. As the fish ages, the caudal fin grows into a spade shape. The males have more exaggerated filaments. Eastern Hulafish quickly form shoals, and ORA recommends keeping them in groups of four or five (or more). When kept in groups these fish exhibit a unique swimming behavior, hovering at an angle that is said to suggest a line or cluster of hula dancers. Trachinops taeniatus grow to a maximum size of about 4 inches (10 cm) and are micropredators, eating small food items such as copepods, Artemia, Mysis, small pellets, and flakes for carnivores. —Available now in limited quantities. A beautiful deepwater strain of Organ-Pipe Coral (Tubipora musica) is an infrequently imported form of a relatively common coral. Unlike many of the commonly available shallow-water forms, this variety has completely fused pinnules, with a striking contrast between the vibrant green main polyp body and the stark white edging created by the fused pinnules. The green and white contrast of the polyps, combined with the bright red pipe-like skeleton that gives this coral its name, makes it a stunning addition to a reef aquarium. 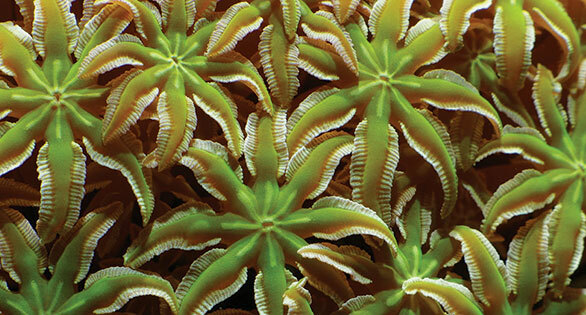 This coral will thrive if provided a location with relatively low light and strong, large-volume water flow. Detritus settling in the skeleton will lead to algal overgrowth of the slow-growing polyps, so ideally the water flow should move upward through the coral. 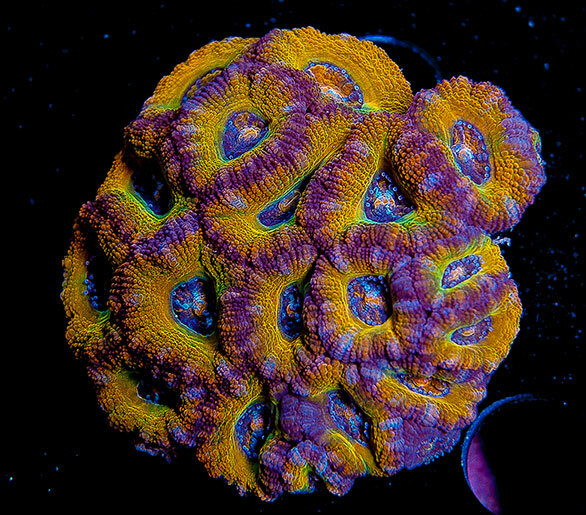 A limited number of specimens aquacultured by A&M Aquatics are available from time to time. A very rare leucistic Zebra Moray Eel that was discovered recently off Oahu, Hawaii, has been imported by Sun Pet, a livestock distributor in Atlanta, Georgia. The collector found it on a coral reef known to be inhabited by other Zebra Morays at a depth of approximately 60 feet (18 m). Zebra Morays are common in this part of the world, but the collector reports having seen only one other in a long career of livestock collection. The white coloration is due to a genetic mutation called leucism, which causes an overall reduction in pigmentation. This rare creature is approximately 34 inches (86 cm) in length and has a hearty appetite. 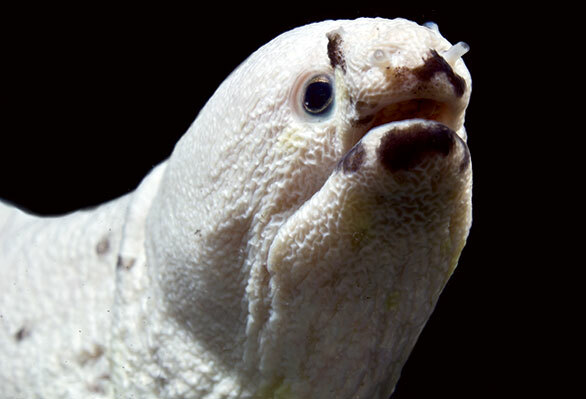 The eel, which is snow white, has light pale patches of yellow on the belly and sides and some dark brown spotting around the mouth, sides, and dorsal fin. “In the 30 years that I have been in the industry, I have never seen one or even heard of one available…ever. This is a great fish for a collector; Zebra Moray Eels are very docile compared to other morays,” says Wisebram. Sun Pet says it is organizing an auction system for such rare finds open only to its own network of accounts, including local tropical fish stores, public aquariums and zoos, and research institutions. Wholesale only. Fanciers of rare marine angelfishes are buzzing over rumors of the availability of aquacultured Maze Angelfish (Chaetodontoplus cephalareticulatus) for the first time ever. They are, in fact, arriving in the U.S., and they are showing juvenile coloration with just a hint of the blue facial mazing coming through. Also known as Blue Maze Angels, these Chaetodontoplus cephalareticulatus were aquacultured by Bali Aquarich on the island of Bali in Indonesia. There are a very limited number of these in existence, and Quality Marine is now home to the first two ever to be shipped to North America. “They are taking our meaty mix as well as some pelletized foods. 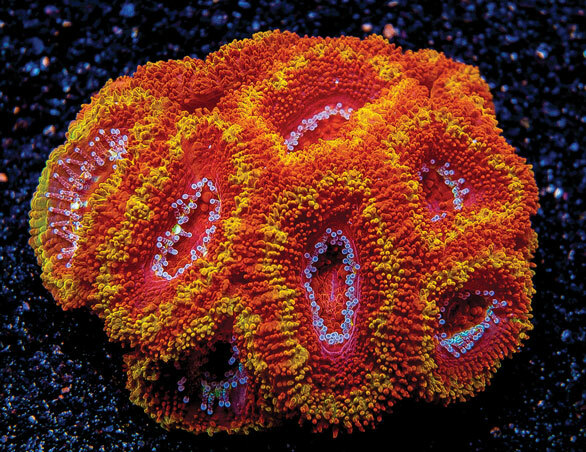 These fish will be sold into the wholesaler’s retail network of independent aquarium shops,” says QM’s Eli Fleishauer. Chaetodontoplus cephalareticulatus is among a number of so-called Holy Grail angelfishes, and it has been suggested that it is a unique species, though it is not technically recognized as such. Some insist—even vehemently—that it is just a regional variant of C. chrysocephalus or a hybrid. 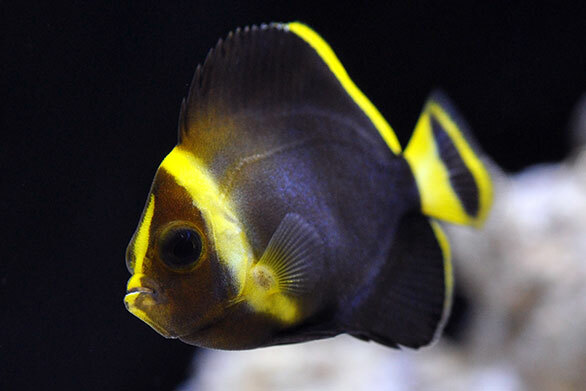 Fleishauer believes it is easier to use the suggested species name, as it indicates an angelfish with a distinct color form and range. Wholesale buyers only.